The exceptional snowfall on the Middle East left much chaos behind it, but also a number of astonishing images that will go down in history. Ancient and much celebrated locations for once met the magic of snow, as testified by the amazing photo gallery we put together for you. In many of the regions affected, snow did not fall for over a century. Apart from the fascinating beauty of snow, the unique wave of bad weather has also created many problems in several cities and countries. 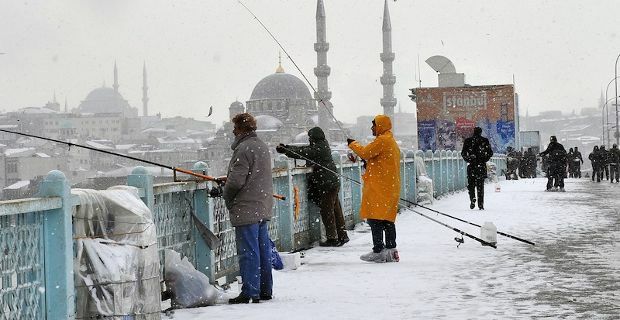 Snow first blanketed Istanbul (Turkey), then fell on Israel, covering Jerusalem and Gaza, then Lebanon, Egypt, Jordan and the West Bank. In regions normally thorn by war, sworn enemies managed to get together cooperatively in order to fight back the damage of the exceptionally bad weather Israel, for instance, eased its restrictions on the Gaza Strip to send fuel and water pumps to flooded neighbourhoods. Indeed, situation in Gaza was so bad that fishing boats were dispatched to flooded neighbourhoods to evacuate residents, and thousands were left homeless. It would have been criminal for the Israeli military force to just stand back and watch the Palestinian population to fight it out for themselves. Temperature steadily under zero created further problems to other suffering populations, especially the refugees fleeing war in Syria. The United Nations on Sunday began airlifting food, blankets and medical supplies to north-east Syria, where snow covered most of the country, including the capital Damascus. Heavy snowfall not only paralysed telecommunications but also caused a significant increase in the water mark of all major rivers resulting in extensive floods. Despite the widespread hardship though, many people still managed to embrace the unfamiliar conditions and enjoy them, as can be seen in our amazing photo gallery. Visit Taba Heights Egypt For Five Star Luxury.